VILLAS ADIORA are located in a complex of newly built modern villas. These stunning upscale villas have been designed with a myriad of benefits in mind: luxury, privacy, comfort and a spacious environment. Ideal place for sea lovers and for those who want a peaceful break for their vacation. Breath-taking views on the sea and the surrounding islands of Kefalonia, Ithaca (believed to be the birthplace of Homer’s Odysseus) and Meganissi are especially beautiful during sunrise and sunset. 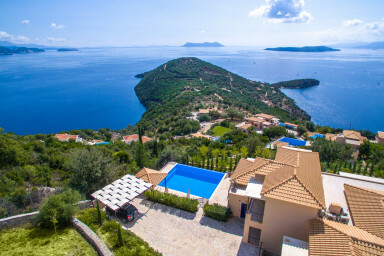 The villas are located near Sivota Bay at South-East of Lefkada Island in a spectacular scenic location. Colorful variety of Greek tavernas and shops can be found in the village of Sivota, only 1.5 km from the Villas. Rent a boat in the village and enjoy the beauty of surrounding islands and natural beaches! The villas offer spectacular views of the azure waters of the Ionian Sea. There are vast expanses of Olive groves and flowers in the Villas' garden leaving one in awe of such beauty. VILLAS ADIORA are composed out of two villas - Villa Auriga and Villa Columba - just next to each other with own entrance. They can welcome 22 people very comfortably and potentially a few extra people on extra beds. Each villa is fully air conditioned and has its own infinity pool. The villas are cleaned weekly, linen and towel change every 7 days. Wi-Fi package with 10€ pre-paid card for each villa as a welcome gift from us will give you access to 5G of Datas valid for 7 days. This is 3G device system as no land line is coming to this area. Private parking is available in front of each villa with capacity for 7 cars or 3 vehicle with a boat cart. The road to reach VILLAS ADIORA is partly unsealed for about 1,5 km. It is accessible by standard cars; although a 4x4 will make it more comfortable. Feel free to contact us if you wish to reserve a rental car for your stay. The villa is prepared to welcome 10 people very comfortably and to accommodate potential extra few people with extra beds. The villa is fully air conditioned. A large private infinity pool (9m x 7,5m; 2,60m deep) with spillway, an outside shower, comfortable sunbeds and umbrellas, outdoor gazebo (pergola) and a large terrace with an astonishing view of the Ionian Sea will make your breakfast, lunch and dinner that much more special. Entrance door is opening into the living room and its balcony with one of the best sea view of the residence. Kitchen is linked to the living room with a large dining area. Kitchen is fully equipped with a refrigerator, an electric stove oven, a dishwasher, coffee makers, a toaster, a kettle, a microwave oven, kitchen utensils and tableware. At this level there is one double bedroom with its own balcony and a bathroom. A staircase gives you access to the ground floor and the top floor. The top floor welcomes 2 double bedrooms with queen size beds and a bathroom with toilets and shower. One of the bedroom has an amazing balcony with a view that will make you speechless. A prefect place to meditate, rest, read while watching the "ballet" of the yachts leaving and entering Sivota Bay. An the ground floor there are 2 very comfortable bedrooms with king size beds. Luxury mattresses that are present in all the rooms will welcome your rest and dreams after a beautiful day sailing or sightseeing around Lefkada island. This floor has 2 bathrooms with a shower each. One of the bedroom has its own private bathroom. One of the bedrooms has a direct entrance into the garden and the pool area. Finally a second living room allows to welcome 2-4 extra persons at sofa beds and potential extra mattress we can add upon request. There is an extra room that can be used as a utility room accommodated with a washing machine, a house vacuum cleaner and an iron with a stand. Suited to welcome 12 people very comfortably and to accommodate potentially a few extra people with extra beds. The villa is fully air conditioned. A large private infinity pool (6,50 m x 5,70 m; 2,50 m deep) with spillway and an outside shower, comfortable sunbeds and umbrellas by the pool, an outdoor gazebo (pergola) to relax in the shade and a large BBQ to accommodate meat and fish for all the family and friends are provided. At the main entrance of the villa, there is a spacious open plan living room and a large dining area, a living room area with plasma LCD television with satellite channels, audio music player and DVD player. A fully equipped American kitchen is linked to the dinning area and is furnished with a refrigerator, an electric stove oven, a dishwasher, the coffee makers, a toaster, a kettle and a microwave, kitchen utensils and tableware. Finally, there is a large terrace with an astonishing view of the Ionian Sea which will make your breakfast, lunch and dinner just unforgettable. On the left from the entrance, there are 2 bedrooms with double beds. A common bathroom is as well available for both bedrooms. At the ground level there are 4 very comfortable bedrooms with kingsize beds. Luxury mattresses that are present in all the rooms will welcome your rest and dreams after a beautiful day sailing or sightseeing around Lefkada island. This floor has 2 bathrooms with a shower in each. Two bedrooms offer panoramic sea views and entrance directly into the garden and the pool area. To choose VILLAS ADIORA for your vacation is a lifetime experience. Our selected portfolio of partners is ready to provide quality services such as babysitting, chef at home, massages, yoga, boat rentals (sailing or speedboat), car rentals, mountain biking, sea kayaking, scuba diving or hiking in Lefkada hills. Our team is ready to ensure your holidays are just perfect; providing any assistance you may need. We are looking forward to meeting you and answering any questions you may have. Me and my 14 family members enjoyed very much our stay at the villas Adiora. 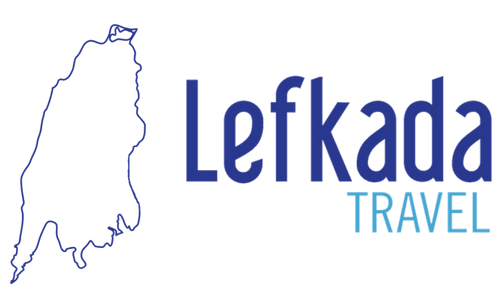 © 2019 www.lefkada-travel.com. All rights reserved.